Fifa Nature Reserve in Jordan was declared a Wetland of International Importance (“Ramsar Site” no. 2294) on 18 April 2017 under the Ramsar Convention on Wetlands. The Site’s lowest point stands at 420 metres below sea level, making it the world’s lowest location of a Wetland of International Importance. The Site lies in the Jordan Rift Valley to the south of the Dead Sea, in south-western Jordan. It is fed by water from various sources, which include natural permanent springs, a permanent artificial irrigation and seasonal water which drains from four wadis. The Fifa wetland is important for the livelihoods of people living around it, as it provides water for irrigation and drinking water. The Site supports the hydrological balance of the Valley, controlling floods by receiving a large amount of rain water which flows onwards to the Dead Sea. It supports two globally vulnerable species, Macqueen’s bustard (Chlamydotis macqueenii) and dabb lizard (Uromastyx aegyptia). 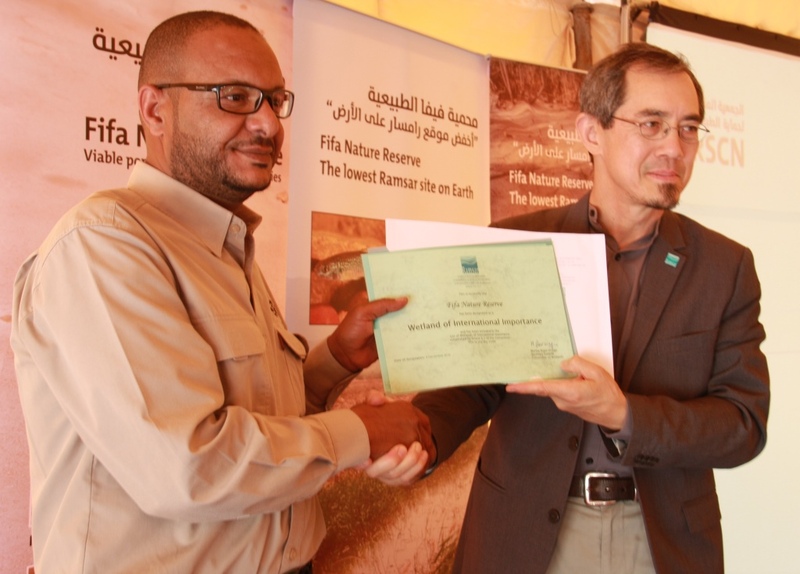 The designation was announced by the Minister of Environment of Jordan, Yassin Al-Khayyat and the Ramsar Convention Senior Regional Advisor for Asia-Oceania, Lew Young, at the official designation event at the Fifa Nature Reserve. Jordan joined the Ramsar Convention on Wetlands in 1977, as the first Arab country to accede. In the same year, Azraq Oasis (Ramsar Site no. 135) was declared the first Wetland of International Importance in the Arab world.